Kenny Thomas is a one of our long-standing Dribble heroes! For someone so young, he has been a spokesperson for UCLA Mattel Children’s Hospital and a vocal one at that! As a National Ambassador for Hyundai Hope On Wheels, Kenny traveled all over the country speaking about his experience with Hodgkin’s Lymphoma and an advocate for pediatric cancer research. Kenny is now 14 years old and has started high school. He made the basketball team in his first year—his favorite sport! 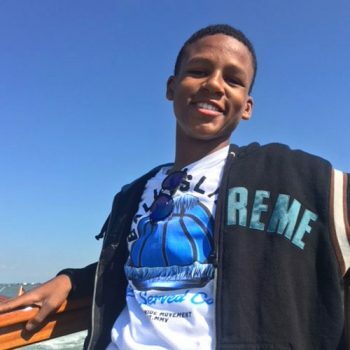 Kenny is a very active young man who loves to play sports and hang out with his friends doing the usual kid stuff like playing video games and going to movies. Kenny’s wonderfully supportive parents took him along on a Grand Tour of Europe this past summer. Kenny is a survivor and he enjoys meeting the many families and kids with cancer who look to him as a model of courage, strength and positivity as they fight their disease. He is generous of spirit and, someday, we hope to see him on the basketball courts, calling a game or on the wards as a physician healing others. He is our hero!